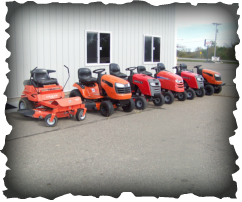 We always have trade ins and late model new mowers at discount rates. Give us a call with any questions. Sunrise also has a partnership with A&J Electric for fixing electric motors. They are currently in Pierz on Wednesday's and do service calls 24/7. Sunrise Ag Repair in Pierz is proud to be your top of the line local Stihl and Gravely dealer. Stop in and check out our awesome line of Stihl and Gravely equipment. We have a great line of products in stock with the availability of ordering whatever you may want as well. Along with the sale of new equipment we do the repairs and warranty work. Please come in the South entrance door right next to the two big doors. Stop in and Jon will take care of your needs.